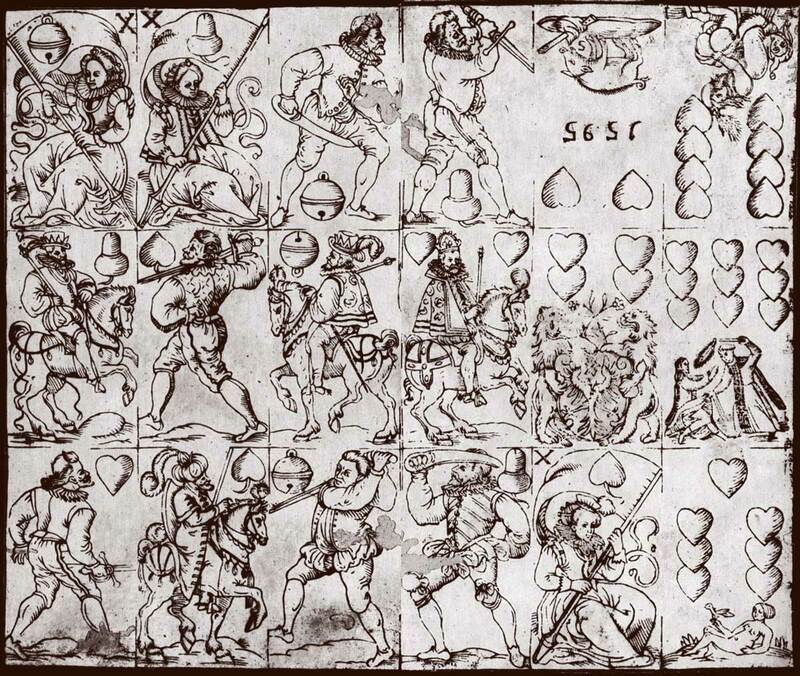 These images recall some 16th century German cards by Heinrich Hauk and others and which are also related to the Bavarian and Franconian patterns. These patterns are shared in neighbouring countries, in Austria as the Salzburger pattern and in Czechoslovakia it has become known as the Bohemian pattern. They are descended from the oldest of German-suited packs. 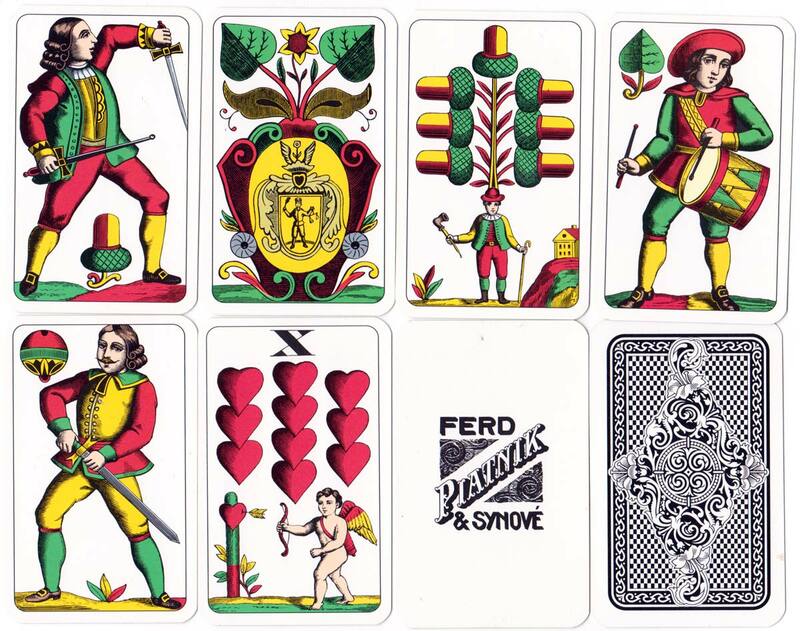 As playing card designs were copied from workshop to workshop, characteristics from archaic models still survive today in cards such as these which have become standard patterns. The Knaves are divided into military categories and hold long spears, or halberds, swords and musical instruments. The Kings are seated and each has two suitmarks. 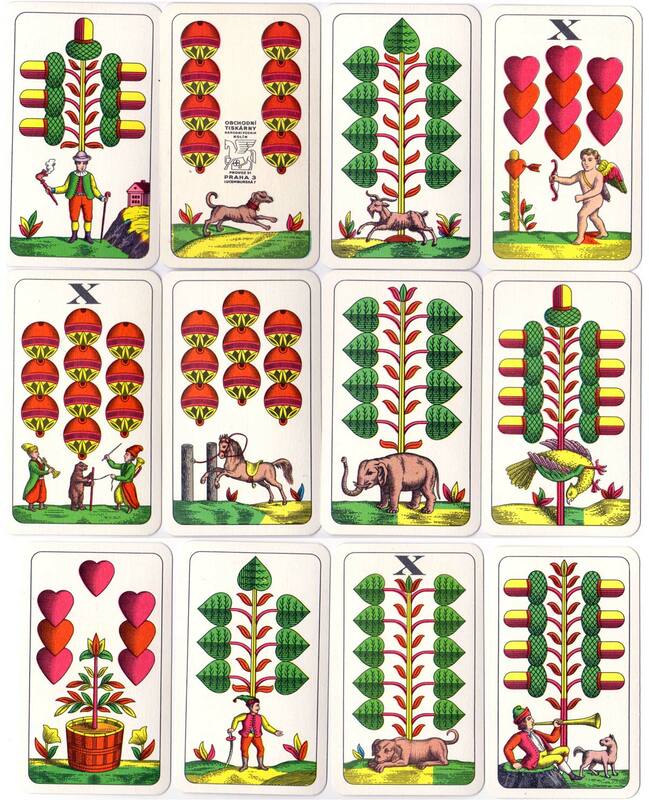 The numeral cards have little vignettes at the bottom with animals or rural scenes. Cards from the area which was formerly the Austro-Hungarian Empire are immensely varied. Some of them have special regional differences and are named accordingly. Just as regional dialects are spoken within different areas, similarly, regional styles of playing cards follow the fashion for certain games, ethnic groups or social classes. 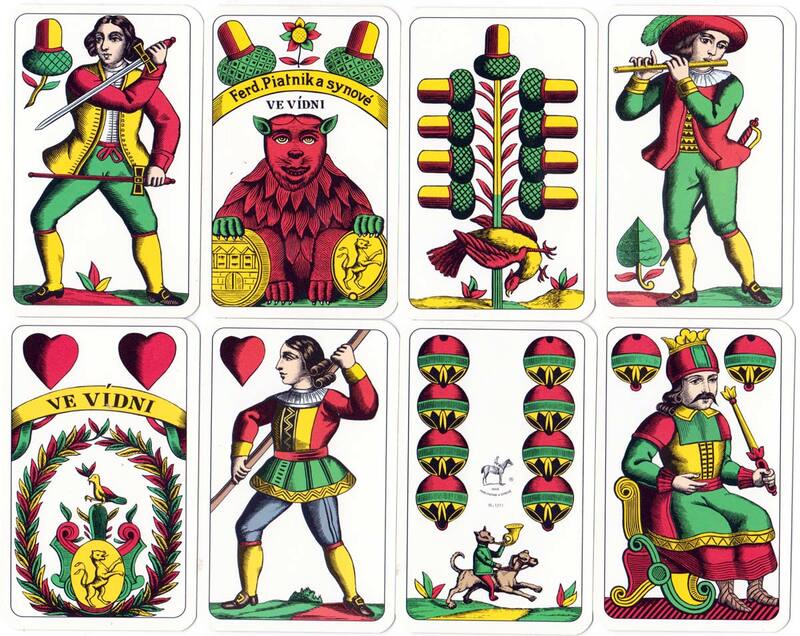 The Bohemian pattern, also known as the Prager pattern, shares similarities with other old German-suited patterns, such as the Bavarian and Franconian, and preserves details which have survived from the earliest days of German cardmaking, such as soldiers holding weapons and animal or burlesque vignettes on the numeral cards. German-suited packs have tended to remove the lower numeral cards, apart from the Deuces (Twos), to reduce the number of cards from 52 to 36 or 32 cards. This is a northern custom, whereas in areas using Spanish or Italian suit systems, it is more customary to drop the 8 & 9s and to have 10, 11 & 12 as the three courts, making 40 card decks. 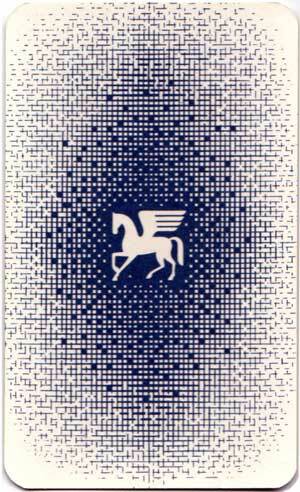 • See also: Czech Nationalistic • Czech 'Hussite' pack • 1908 Prague Jubilee Exhibition • 'Jugendstil' designed by Artuš Scheiner, 1920 • Ritter & Cie "Art Deco", 1933 • Eagle Playing Card Co., Ltd. 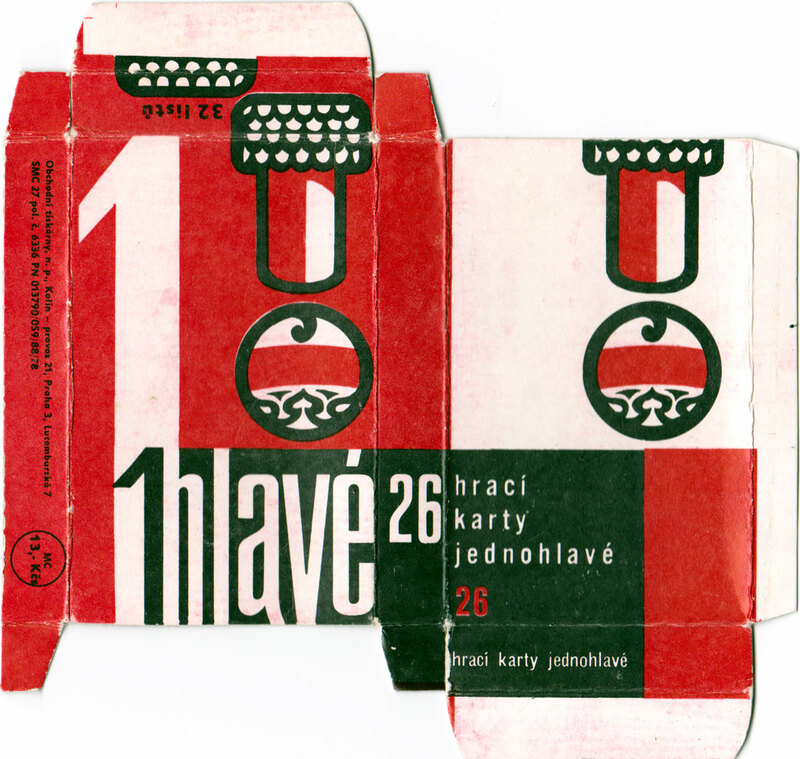 Above: the 'Prager' or 'Bohemian' pattern manufactured by Ferd Piatnik & Synové, Vienna, c.1995.